Oxford Full Back Patient Hoist Sling With Leg Padding. 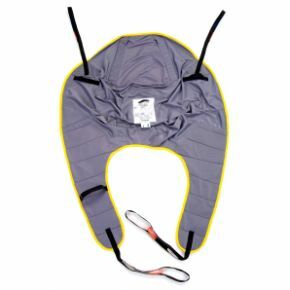 The Full Back Sling is an easy fit,contoured sling designed to fit approximately 85-90 per cent of patients. The Full Back Sling is a fully supportive sling incorporating an integral boned head support and leg padding. This sling is unsuitable for lifting amputees. The Full Back Sling can be used in the Sitting, Sitting / Recumbent and Recumbent positions.